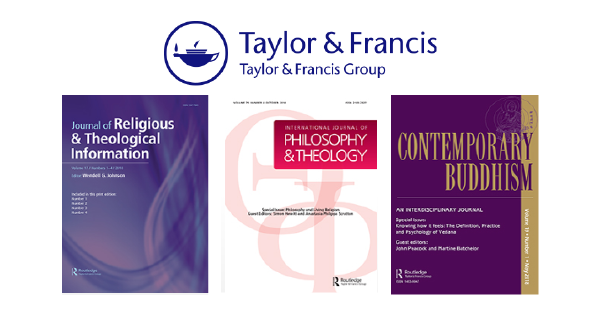 UK-based Taylor & Francis (T&F) has long been a guiding force in the world of academic publishing. A prominent producer of books and journals since 1852, they currently publish more than 2,700 journals and 7,000 new books each year. Their backlist is also extensive, containing over 140,000 titles spanning 136 years in both print and digital formats. Initially a leader in STEM publications, T&F has thrived over time by continuing to diversify their content relationships through a balance of acquisitions and top-tier original content. Their acquisition of the humanities publisher Routledge in 1999 helped make them a leader in the social sciences as well. Since then the humanities, and fortunately for us, the religion list has grown significantly and contains many subject-leading titles sought after by scholars in this space. ATLA is very pleased to be partnered with T&F for a ten-title full-text agreement, containing many of those exceptional journals. All the licensed titles are described below and are available now in ATLAS PLUS®. This journal focuses on the current state and influence of Buddhism. Curating articles from authors across all aspects of academia, the journal aims to keep a finger on the pulse of issues related to the subject around the world. According to the T&F website, the journal “examines the historical, doctrinal, literary, social, political, developments that have formed contemporary versions of Buddhism, East and West.” Contemporary Buddhism is a steadfast resource for scholars looking for a global view of the subject. Arising from the intersection of two perpetually intertwined subjects, Culture and Religion is focused on the historical significance surrounding these two often inseparable arenas of history. The journal seeks investigative articles from scholars in a vast range of fields, including anthropology, post-colonial studies, gender studies, as well as cross-cultural and religion studies. According to the T&F website, the journal aims to expose “why cultural studies have hitherto neglected the significance of religious manifestations in cross-cultural perspectives, and define ways in which the discipline of religious studies needs to engage with other areas of contemporary critical, cultural, and anthropological theory.” Culture and Religion is an excellent resource for a wide range of studies in this area.